I used to view events on the plains during the nineteenth century as a simple conflict between whites and the few remaining Indians, between settlers and the people who already lived there. 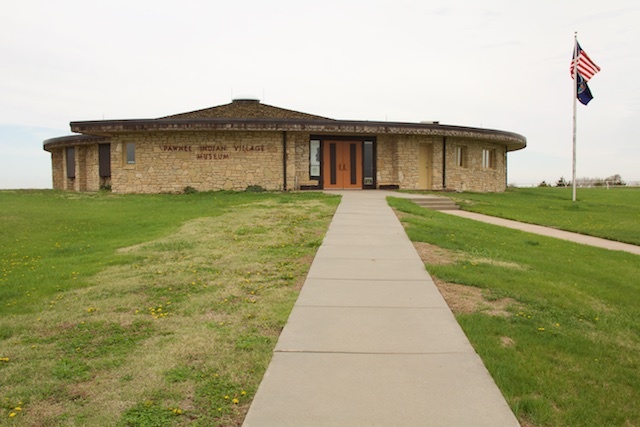 My visit to the Pawnee Indian Village Museum in northern Kansas complicated that simplistic understanding. The museum is located on the site of a Pawnee village, inhabited from the 1770s until 1801 or so. For most of the three hours I spent there on April 18, I was the only visitor. Site administrator Richard Gould and I stood under the slightly conical roof of the building, which in the 1960s was constructed around the floor of an earth lodge, and we discussed so many things I couldn’t possibly write them all down. I marveled at how complex the situation was in the 1800s, how profound were the social changes in just a few decades. The Pawnees lived in a world getting more and more crowded because of people (not just whites) migrating from the east; they had to manage relationships (peaceful and warlike) with the Missouria, Potawatomi, Kaw/Kansa, Osage, Sioux, Cheyenne, Comanche, Kiowa, Arapaho, and white explorers, traders, and settlers. All those changes put pressure on them and the environment. I’ve never studied history in any deliberate or comprehensive sense, so now I find myself trying to fill in the gaps, piecemeal. And when white people talk about American Indians, they tend to see them as Frodo once saw Galadriel: “present and yet remote, a living vision of that which has already been left behind by the flowing streams of time.” I hope among these fragments of information I’ve provided, you find something that inspires you to visit some quiet corner of your world and to attempt to see things as they once were. Names are an important subject in history, and struggles over who gets to name a site are often fierce. This Pawnee village, which has had more than one name over the years, was located on a bluff near the Republican River, a name bestowed by French traders who found the tribe’s system of government to be republican. Why? At least partly because Pawnee women could vote. This Pawnee band (one of four) called themselves the Kitkahahki and the river the Dirty Water River. I think the river lies beyond that line of dark evergreens in the picture below, so the village was far enough from the river to be safe from flooding. The village fields, tended by women, were closer to the river. 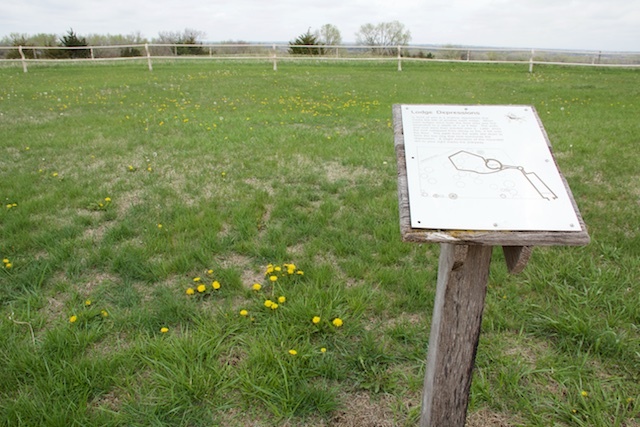 In the early 1700s, according to the Pawnee Nation’s website, there were more than 60,000 Pawnee living along the North Platte River in Nebraska, north of this village site. By the 1800s, there were 10,000 to possibly 30,000 Pawnee living in Kansas and Nebraska. When Richard Gould and I were done talking, I circled the earth lodge floor, looking at the artifacts left in place there and at the displays on the walls. 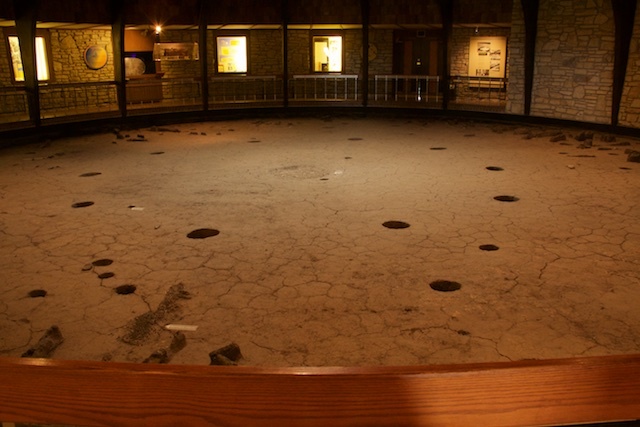 The large holes in the floor held poles that supported the original roof. Here we are looking toward the back of the lodge. The doorway, off the right edge of this picture, faced the morning star. I walked the path outside, noting the slightly raised rings under the grass where the walls of another earth lodge had collapsed. You may find them easier to see near the top of the picture. I learned that the acquisition of horses, perhaps in the early 1700s, allowed for larger villages. 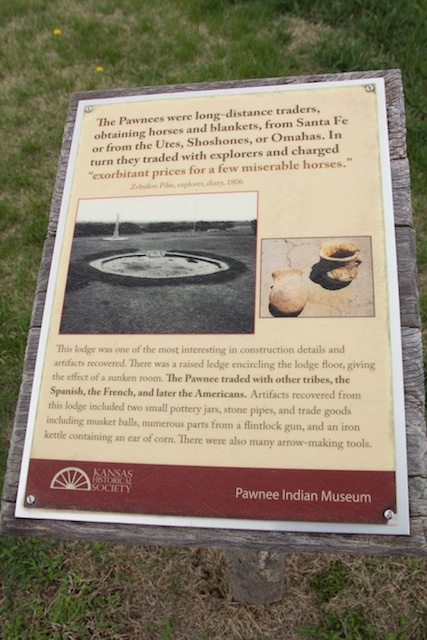 The horses made it easier for the Pawnee to hunt, and also brought in money when they were sold. Village size was no longer determined by the amount of food that could be grown on-site or the meat that could be obtained by hunting on foot. The Pawnee were the dominant force on the Central Plains until the early 1800s. They lived in Kansas and Nebraska but traveled as far west as Colorado to hunt. Traders had to cross Pawnee territory to get to the tribes with whom they were licensed to trade. I had always thought of traders as free agents, not people who had to get US government permission to sell to others. Pawnees became scouts for the US government and, in one case, pursued Cheyenne Dog Soldiers into Colorado. Eventually, in the 1870s, they were compelled to move to a reservation in Oklahoma. In 1903, a census recorded 647 Pawnee. You can see some of the names on that census in the picture below. This display was hard for me to forget. I saw two sacred bundles at the museum, religious objects that were reportedly owned by women but used only by men. One was open, and one was not. The closed bundle in the museum was saved from a battle with the Brule band of Sioux at Massacre Canyon, near Trenton, Nebraska, when a man tied it on his daughter’s back and told her to ride off with it. Later it was donated to the museum. It has not been opened since 1873. This small museum, located on the Republican River in northern Kansas, near the Nebraska border, may seem remote to modern-day Americans. But from the 1770s through at least 1801, it was a busy place, home to hundreds of Pawnee. See this blog post, “A Visit to Riverbed City,” for Roger Echo-Hawk’s account of his visit to the museum. His story intrigued me, so I stopped in at the museum on my April trip from Denver to Kansas City, where most of my family live. Hi. Excellent writing. 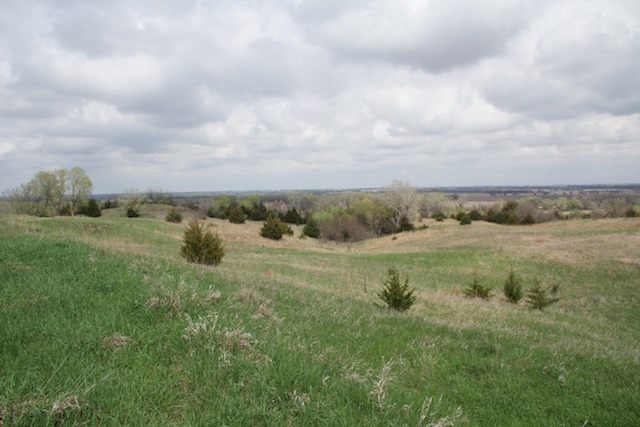 However, I believe the incident where the bundle made it home with the daughter was at Massacre Canyon, near Trenton, NE. I may be wrong, but that’s what I was told. 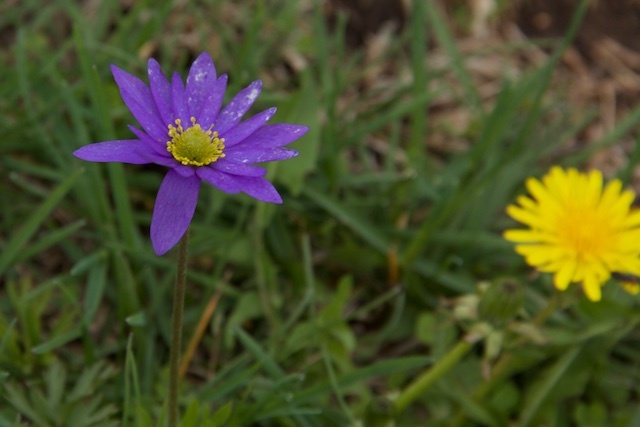 Thank you for commenting. I have forwarded a link to this post to the museum to ask for their input about the location of the fight. I don’t remember discussing the location, but Trenton certainly seems possible, especially if the Pawnees were on their way to or from a hunt. I heard back from Richard Gould, and he also said the battle was at Massacre Canyon. I’ve changed to reflect the information from the two of you. There was a mention of a North Platte River. There is a Platte River that has a North and South fork but North Platte is a town…..maybe there is also a North Platte River…I need to research I guess before I shoot my mouth off. Excellent article. Nicely Penned! Very sad to me. Thanks, Connie. I like this museum very much. It’s a sad commentary on our inhumanity to the original inhabitants of this country. 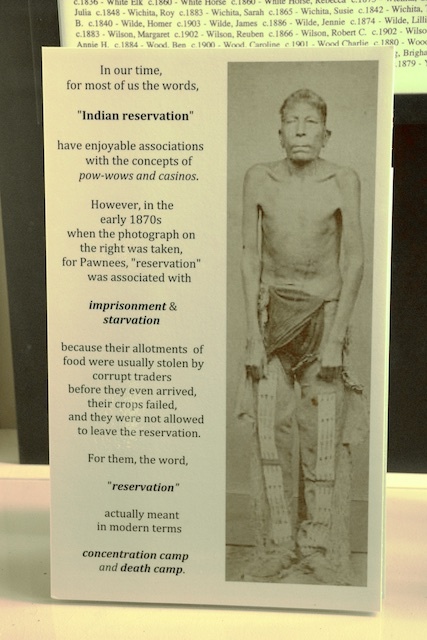 The reservation system still destructive. Treaties are still being broken but “out to sight, out of mind” explains a great deal. When will they be welcomed as the “first citizens” of this great country. I’m not sure, Linda, but I do know they are fighting back. And although this village site was caught up in the political cross-currents of the time, it is still good to visit it and see how people used to live 200 years ago.